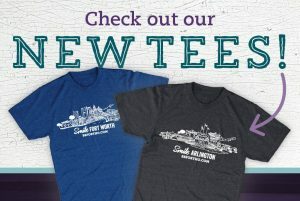 Come by one of our convenient office locations today to check out our new t-shirts that feature our home towns of Arlington and Fort Worth! Our Arlington tees feature attractions such as Six Flags Over Texas, Hurricane Harbor, The Parks Mall, and much more! The Fort Worth tees show off places such as the Trinity River, Fort Worth Stockyards, the Fort Worth Zoo, and other city sights. We take pride in our communities and love sharing smiles across Texas. All new patients get a free tee – now is the perfect time to schedule a complimentary exam for braces, Invisalign, TMJ treatment, or headache relief. Call us today at an office near you to schedule your appointment!